Playtime’s nearly over at an East Harlem playground, which may be relocated to accommodate a $1 billion development that will include the area’s tallest residential tower. With backing from city lawmakers and Mayor Bill de Blasio, state Sen. Joe Serrano and Assemblyman Michael Benedetto introduced bills that would shut down the Marx Brothers Playground on Second Avenue and East 96th Street within the week, reported the New York Post. 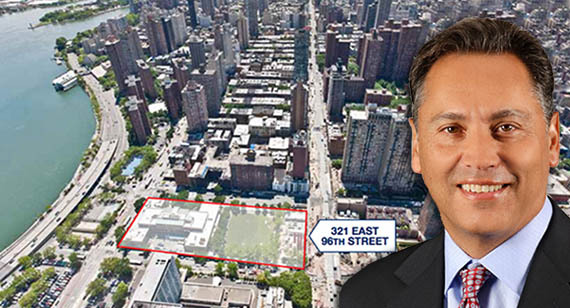 The 1.5-acre playground is on the site of a 1,100-unit mixed-income residential tower that will be the tallest apartment building north of 60th Street. The project is a partnership between developer Avalon Bay and the NYC Educational Construction Fund. In addition to a 720-foot residential tower, plans call for three new schools. The developers plan to build a replacement playground on the site.